Laurel Leaf Library, 9780440418122, 212pp. 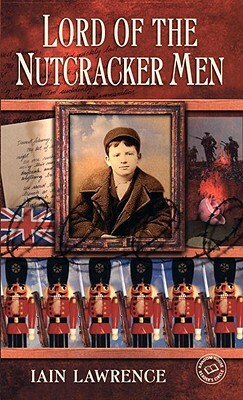 Ten-year-old Johnny eagerly plays at war with the army of nutcracker soldiers his toymaker father whittles for him. He demolishes imaginary foes. But in 1914 Germany looms as the real enemy of Europe, and all too soon Johnny's father is swept up in the war to end all wars. He proudly enlists with his British countrymen to fight at the front in France. The war, though, is nothing like what any soldier or person at home expected. The letters that arrive from Johnny's dad reveal the ugly realities of combat and the soldiers he carves and encloses begin to bear its scars. Still, Johnny adds these soldiers to his armies of Huns, Tommies, and Frenchmen, engaging them in furious fights. But when these games seem to foretell his dad's real battles, Johnny thinks he possesses godlike powers over his wooden men. He fears he controls his father's fate, the lives of all the soldiers in no-man's land, and the outcome of the war itself. Iain Lawrence is the author of many acclaimed novels.